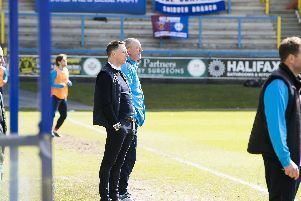 Gareth McClelland reckons FC Halifax Town’s success rate with lower league players is a huge selling point to potential new signings. The Shaymen have been stepping stones to the likes of Jamie Vardy, Lee Gregory, Scott Hogan, Marc Roberts and Dan Gardner in recent seasons, all of whom are now playing in League One or higher. And McClelland thinks that list of success stories helps to attract new signings to The Shay. “Hopefully that gives us an edge over a lot of other clubs in the market,” he said. “Another massive selling point is that Neil is patient with new players. “It’s like with Marc Roberts, he had a difficult start in the Cambridge game at the start of his first season. “But credit to Neil, he gives players a chance and he stuck with Marc and he developed really well. McClelland is confident he and fellow scout Mark Gould are looking in the right areas for new players. “Myself and Mark identified 10 players last season that we should sign and they all went on to play in the Football League. “Mark did some work for Chesterfield and we built up a relationship after meeting at St George’s Park in Burton while watching a trial game. “He’s been a great asset to the club, especially with his under 21 knowledge. He watches a lot of games. McClelland believes players should think carefully before joining bigger clubs, where they can often be left waiting for a chance in the first-team. “I understand it from the clubs’ point of view that they want to get the best price for their players but sometimes it’s best for the players to just move up perhaps two leagues at a time rather than making a big jump,” he said. “The prime example is Jamie Vardy, who progressed gradually up the ladder. “Sometimes it’s not always the best idea to go straight to a bigger club because they often get put into reserve football, whereas they would play first-team football at a lower level. “When players are 18, 19, 20 all they want to do is go full-time at the highest level they can. McClelland is also wary about the role of agents in transfers involving lower league players. “Players who are aged between 18 and 21 want full-time football and their agents encourage them to do that because it’s more beneficial to them,” he said. “But a lot of them just end up playing reserve team football. “I’ve got a good relationship with a lot of agents, which is important because you need them when you are trying to sign a player or if you’re trying to arrange a loan move for one of your players. “Players need a representative to look after them as there are so many footballers who don’t know what they’re signing or what their contract entails. The competition for the hottest non-league talent is hotting up, according to Town’s chief scout. “You always want to get the next gem but there’s only so many of them around - they don’t grow on trees. “But you’ve got to be patient and be prepared to back your own judgement. “It’s frustrating when you lose out on players but I’m happy with the players “I’ve identified so far and I’m still hungry to keep finding the next Jamie Vardy. “It’s a pleasure to work for Halifax because the people I work for respect me and back my judgement. “It’s very enjoyable and when you see the likes of Marc Roberts going on to play in the Football League it makes it all worthwhile. “We are watching players at all levels but it often comes down to where they are based, where they’re willing to move to and, of course, money. “My networking is very important, speaking to people on a regular basis. “As soon as a player in the North West Counties League or the Evo-Stik League shines, I need to know straight away.